Umpires are getting better at enforcing Replay Review's new 30-second Manager's Challenge time limit, which has resulted in a minor managerial rebellion as evidenced by Joe Girardi's press conference remarks asking for a meeting with MLB Replay shot-callers after Tom Hallion denied Girardi's late replay request, and Fieldin Culbreth's recent ejection of Brad Ausmus after Culbreth denied Ausmus' untimely review request. The 30-second process seems simple enough: Field Timing Coordinators start 30-second clocks after each close play that might go to review. If the Manager challenges (or requests a Crew Chief Review) in that time, the play goes to Replay. If not, it doesn't. Complicating matters, however, the clocks default to a blank setting after reaching zero seconds on the countdown, not all Field Timing Coordinators are consistent about starting the clocks after every close play (for instance, a seemingly benign no-call that might turn into a boundary issue that isn't apparent in real-time), and some situations (e.g., end of innings, pitching changes) call for the clocks to be set to times greater than 30-seconds in length. Pre-season table of Replay Review timelines and limits. 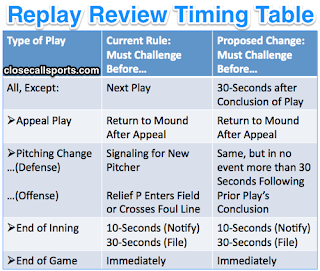 To recap, there are several time limits pertaining to Replay Review (see attached table). The big change for 2017 concerned the introduction of a 30-second time limit for all manager review requests, regardless of game situation, while emphasizing enforcement pertaining to the various time limits already in existence for End of Inning (10 seconds to notify umpires of intent-to-consider a review, and 30 seconds to actually file the challenge or request) and End of Game (immediately) scenarios. The following examples portray how untimely replay requests were addressed by various crews. 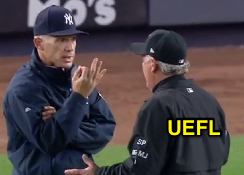 Most recently, on Wednesday (June 7), Tom Hallion's crew refused to honor Joe Girardi's request for a review on a home run/out/fan interference play because the crew said Girardi failed to satisfy the Replay Review regulations pertaining to time limits, namely the 10-second hold time limit that follows a third out play. End-of-Inning 10+ Second Notification Denied Case Study: Crew Hallion: With two out in the 6th inning of the Reds Sox-Yankees game, Yankees batter Chris Carter flied out to Red Sox right fielder Mookie Betts, who leapt at the wall and came down with the baseball in his glove. Replays indicate the batted ball first contacted a fan reaching over the wall before settling into Betts' glove, inspiring Girardi to request the umpires invoke a Crew Chief Review to consider the boundary fan interference question. Hallion denies Girardi's untimely request. Tom Hallion's crew ruled that Girardi failed to inform any of the umpires of his intent to review the play within 10 seconds of the inning's third out pursuant to Replay Review Regulation II.D.3, and thus denied Girardi's request. Hallion's crew had the right idea, but the language of II.D.3 is slightly different for boundary calls, which are exempted from the Manager's Challenge and must be initiated by the Crew Chief: "In the case of a play that results in a third-out call and is subject to review at the discretion of the Crew Chief, the Crew Chief must either immediately initiate a Replay Review or signal for an Umpire conference to discuss the play while holding the defensive players on the field." Because Hallion did not immediately initiate a Replay Review or umpire conference while holding the defensive players on the field (primarily because nobody knew of the potential of fan interference until well after the teams had already changed sides), Hallion's crew properly denied Girardi's request for an untimely Crew Chief review. Andy Green is upset over late Nats challenge. End-of-Inning 10+ Second Notification Allowed Case Study: Crew Layne: On May 26, Jerry Layne's crew entertained a Nationals challenge after the third out of an inning in which Manager Dusty Baker failed to inform the umpires of his intent to internally review the play within the 10 seconds as prescribed by rule. Like Hallion/Girardi, the closeness of the play—a neighborhood play out call at second base—was not readily apparent and, thus, evaded immediate detection by Washington's coaching staff. Opposing Manager Andy Green, not happy by the untimely turn of events, was seen silently fuming on camera during the ensuing Replay Review. Video: Nats get umpires to review play after the inning break has commenced. 30+ Second Denied Case Study: Crew Culbreth: On May 31, Culbreth denied Mets Manager Terry Collins an attempted challenge filed after the 30-second time limit had expired (37 seconds to be exact), but we wanted to wait for something a little more juicy to analyze. Culbreth ejected Ausmus for arguing a denial. On June 3, Culbreth in his role as Crew Chief ejected Tigers Manager Brad Ausmus after the Detroit skipper objected to the Cubby Crew's policy (or, more accurately, the "MLB policy") of requiring a manager to file his challenge within 30 seconds of the end of the play-to-be-reviewed. 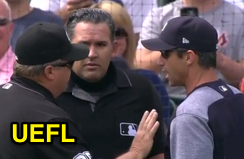 Culbreth ejected Ausmus after plate umpire Manny Gonzalez, as umpire-in-chief, ruled that Ausmus waited too long to file a challenge concerning a play at first base. Timed replays indicated that Ausmus failed to request a challenge of the play until 39 seconds had elapsed since the conclusion of the play. Pursuant to the new-for-2017 challenge decision time limit, Culbreth's crew properly denied Ausmus and Collins' requests for untimely Manager's Challenges. Price and Girardi's late requests were rejected. End-of-Game Denied Case Study: Crew Miller: Last season—prior to the 30-second rule—Bill Miller's crew refused to honor Reds Manager Bryan Price's attempted Manager's Challenge of a game-ending play. Similar to the Hallion/Girardi play, neither Miller nor Price knew the boundary-related play contained a potential dead ball situation until well after the play had concluded and the time limit to notify and/or file had expired. Price actually followed the umpires toward their room in an attempt to bring them back onto the field to review the play, but Miller properly denied Price's request for an untimely Manager's Challenge. Pitching Change Allowed Case Study: Crew T Barrett: Also on Wednesday afternoon, Ted Barrett's crew honored a Manager's Challenge from Nationals Manager Dusty Baker 41 seconds after the play-to-be-reviewed had concluded, and complicated by a pitching change. Barrett allows Baker's untimely challenge. With one out in the top of the 8th inning of the Nationals-Dodgers game, Bryce Harper reached on a fielder's choice out, as the Dodgers tagged out baserunner R3 Trea Turner. Although Baker timely notified the umpires of his intent to internally review the play (although, because it wasn't a third out, Baker didn't need to adhere to the 10-second notification time limit), he failed to actually file his Manager's Challenge until 41 seconds after the play had ended, and only as Dodgers relief pitcher Kenley Jansen had already began jogging in from the home bullpen. In the event of a pitching change, the Field Timing Coordinator starts a routine commercial break clock in significant excess of 30 seconds. Video: Baker's late challenge of play at the plate is honored, and the call is ultimately confirmed. 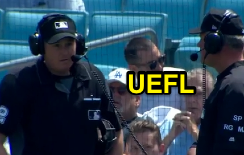 30+ Second Allowed Case Study: Crew Marquez: Also on Wednesday, acting crew chief Alfonso Marquez agreed to review a Manager's Challenge from Cardinals Manager Mike Matheny 36 seconds after the play-to-be-reviewed had concluded. Video: Matheny's late challenge of play at the plate is honored, and the call is confirmed. 30+ Second Allowed Case Study: Crew Holbrook: On June 3, Sam Holbrook honored Craig Counsell's Manager's Challenge submitted 38 seconds after the conclusion of the out/safe (tag - stolen base) play to be reviewed. Video: Counsell requests a review after time expires following the play, call confirmed. Here's an honored 33-second deliberation from June 2's game. 30+ Second Allowed Case Study: Crew Reynolds: On May 25, Jim Reynolds honored Arizona's request for a Crew Chief Review submitted 43 seconds after the conclusion of a bang-bang play at first base. Video: D-Backs request a review well after the 30-second time limit, which is granted; call stands. Outlier Thrown Out: Crew Reynolds: As described on Monday, Clint Hurdle's skirting of the 30-second rule due to the stand-still tradition of "God Bless America" is an outlier and a seemingly acceptable exception to the 30-second time limit. Therefore, this play was thrown out of the analysis.